The loss of an animal or person we love is traumatic and painful. People are not the only ones who suffer when someone they loved passes on. Cats, like all animals, often grieve when they lose a friend. It is heartbreaking to watch. Grief is not limited to the death of another cat friend. Cats can grieve over the loss of favorite people, dogs, and other animals they were close to. They sometimes grieve when their best friends are permanently taken from home, or when favorite cat parents leave for an extended length of time. 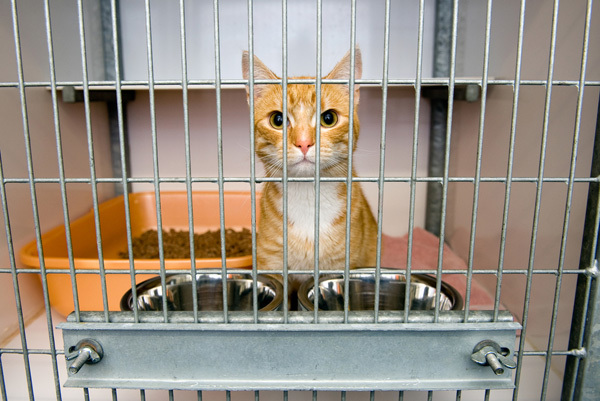 Some cats grieve when they are rehomed or surrendered to shelters. Grief has not been a stranger in my household. Sudan, one of my cats, grieved after Kingsley, his best cat friend, succumbed to lymphoma. 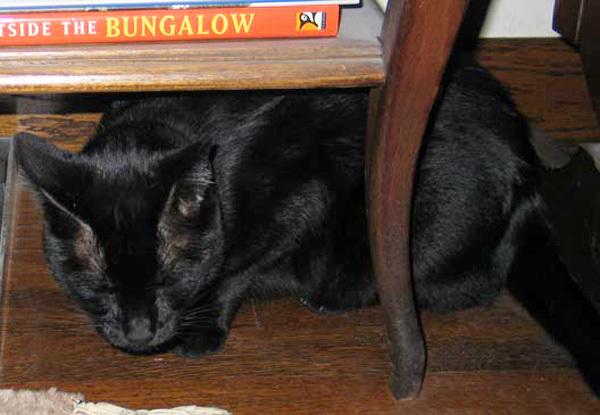 He grieved again when Maulee, my heart-cat who was more than 20 years old, passed a few months after Kingsley’s death. My mom’s cat, Pillow, became depressed and withdrawn after my mom passed on. His grief compounded when he was separated for a brief time from Abby, his dog friend. (Now they are back together again.) Abby grieved too, howling and whimpering for my mom. Watching my little ones grieve broke my heart and deepened my own sorrow. 2013 was not a good year for us. Cats show grief in different ways. Some cats grieve deeply — while others do not appear affected when a companion is lost. Sudan showed his feelings by standing in Kingsley’s favorite room and pitifully howling for hours. For a brief time after Maulee died, he did not play or socialize with anyone — people or cats. Pillow, my mom’s cat, slept more than usual and lost his appetite. He did not eat as voraciously as he did while my mother was alive. Winnie, a client’s cat, stopped eating and almost died after her favorite person left the country for work. Some cats pace, others refuse to play. Other manifestations include restlessness, hiding, increased vocalizing, and becoming clingy. Some cats do not grieve at all — for them it is business as usual. In multicat households, when a cat companion passes, flexible hierarchies are disrupted, compounding the grief with intercat issues. There is no specified time limit for grief. Grieving is a process and can take a few days, a few months, or longer. The time it takes and the depth of the grieving depends on the relationship cats had with their absent friends, the histories and temperaments of individual cats, and other changes and stressors in the environment. Closely monitor cats when they grieve. 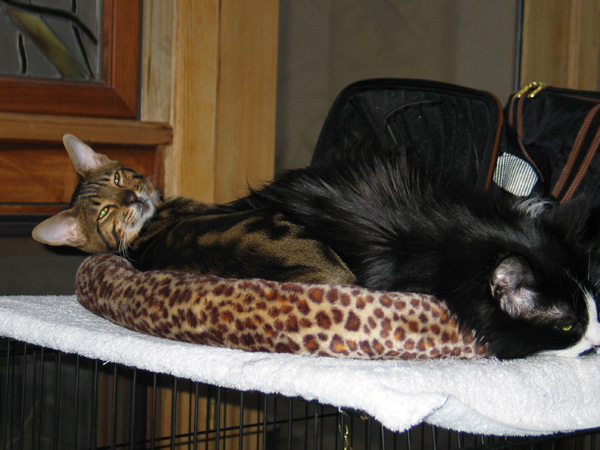 There is a wide range of how cats respond when a bonded companion is lost. Some grieve so deeply that they lose their appetite and stop eating. Those who refuse food for more than 24 hours are at risk of developing feline hepatic lipidosis, a serious and potentially fatal condition. Cats who stop eating for more than 24 hours and those who appear listless need to be examined by a veterinarian as soon as possible. Grieving is stressful, and stress adversely affects the immune system, opening the cat up to diseases. Take grief seriously. Because cats do not adjust readily to change, it is important to keep everything as status quo as possible. This is not the time to remodel the house or move. That said, life happens, and more often than not, we do not have control over the timing of events. But there are things we can control. To some degree, keeping a consistent routine is one of them. Try maintaining the same schedule you had before the little one departed. Feed your cat at the same times every day. If she likes to be brushed, then spend a little extra time grooming her daily. 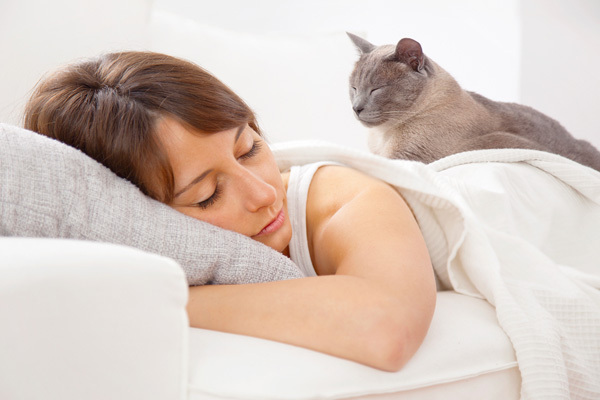 Many cats love taking naps with their favorite people and cuddling with them. If you are one of those lucky cat people, make room in your day for naps and cuddles with your special kitty. Do not let play and other activities she enjoys slip through the cracks. Schedule quality time with her on a daily basis, engaging her in the activities that she historically loves. Enriching cats’ environment and focusing grieving cats on fun activities can help bring them out of their funk. Provide your kitty with new toys, scratchers, and high places to climb. Ball-and-tract toys, soft balls, and catnip toys might catch her eye. Cats who do not respond to the allure of new toys might be jump-started by dipping the toys into pure, flavorful meat broths. Chicken and fish broths usually do the trick. Vertical territory, such as tall cat trees and shelves, can also help lift cats out of the doldrums, especially when the structures are placed next to secure windoww with good views of the neighborhood. Grieving cats often respond to new activities as well as those they have enjoyed in the past. 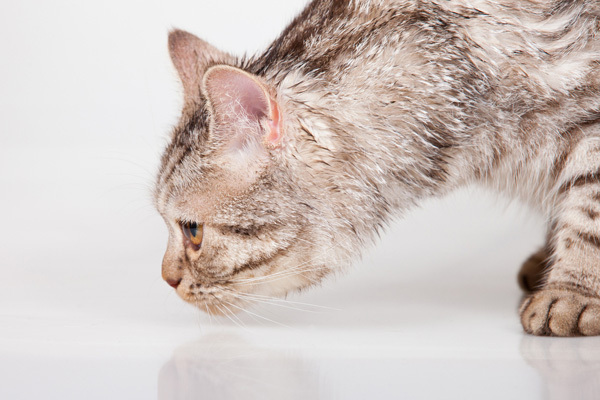 Your cat might enjoy playing, treasure hunts, or a pleasant grooming session. Clicker training, a reward-based training system that is fun for cats and their people, can also help elevate your cat’s mood and bring her out of her depression a little faster. Keep in mind that all of your efforts to help your little one need to be nurturing, gentle, fun, and free of force. Unless the other resident animal was sick, there is usually no reason to be in a hurry to wash beds and furniture that the former companion favored. The scent of the deceased will gradually fade and can help your other cats gradually accept the loss of their friend. There are always exceptions. If your cat is refusing to venture near items or places the deceased cat favored, then a good cleaning might be in order. In addition, you can help ease your cat’s stress by changing her association with the areas by doing activities she enjoys around them. Do not rush out and adopt a new friend for your grieving cat. Grieving is stressful. Introducing a new cat into the fray also stresses everyone. Why compound the anxiety? Wait until the household members are through grieving and have settled into a regular routine before adopting another cat. Everyone processes grief according to their own time clocks. Some cats adjust to the loss within a month — others take much longer. Many cat parents wait years before they feel they are ready to adopt. When you do adopt a new cat friend, keep the newbie separated from your other cats and gradually introduce them to each other. Remember you are bringing an intruder into your resident cat’s territory. The loss of a companion animal is traumatic for everyone in the household. Cats are very sensitive and respond to our emotions and feelings. The way we grieve can escalate and lengthen our little ones’ own grief process. Do grieve, but be aware of how your emotions affect your cats. Part of the process of grieving is feeling completely alone in grief. Pet-loss resources are available to help people process through their grief while being supported by others. Some humane societies offer pet-loss support groups, and there is help online. My favorite online support group is the Grief Support Center at the Rainbow Bridge. It offers supportive chats and forums. For more articles and feline facts, follow Marilyn on Facebook!